Offering hope and maximizing quality of life for people with vision loss. 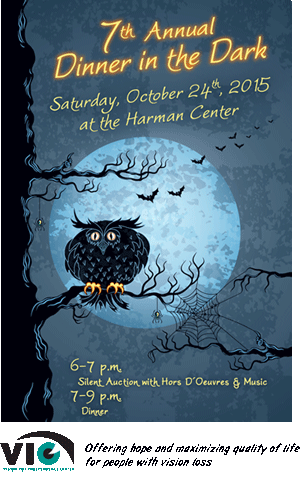 The event was held on Saturday, October 24, 2015 at the Harman Center. Guests dined blindfolded to experience what it means to rely on other senses to manage daily activities. The evening began with appetizers, wine, beer and sparkling cider while socializing, enjoying the silent auction, and music by Teetering Toward Yesterday. Diners were then led blindfolded into the banquet room for a unique and educational dining experience. Central Washington Insurance Agency, Inc.
Peter Hastings, Investment Management, Inc. Event Staff: Lions Club members from Chinook Pass, Ellensburg, Naches, Naches Sunshine, Selah, Terrace Heights, Tieton, Wapato, West Valley, Yakima, Zillah, Wine Country Crushers, VIC volunteers, board members and friends.